The great commission is something terrifying to us, to me. Yet no matter how much I fear these words from Jesus Christ they remind me that I am the Church Militant. After the commission Jesus makes bold claims about how those who believe will do great things like cast out demons and heal the sick. They remind me how I am the hands and feet of Jesus Christ. When I used to read this verse I would tend to think it was directed to only the early church, only for the clergy, or only for those holier than I. That’s not what St. Paul says to the church in Corinth, however. He tells the entire congregation they are the body of Christ, which means all the faithful have a duty—a sacred one, in fact—to engage in the evangelizing and missionary activity of the Church. In Acts chapter 18, we learn how St. Paul and St. Aquila lived their life. We hear about them being tent makers and working together. Then, only after they work do they go and argue against errors and evangelize in the synagogues. I like to imagine these work days like my work day; boring, repetitive, monotonous, and not obviously holy. Overall these work days were probably painfully ordinary and yet they were powerful to the church of Corinth. These saints probably earned a spot amongst the people first as hard working respectable men. These saints probably earned friendships by genuinely caring for the people they encountered. These saints probably earned souls for the Kingdom of God because they invested time and energy in being extraordinarily ordinary. Yes, the souls they brought to Christ heard them in the synagogues, but the first evangelization happened in the daily grind. The first time the evil one lost his grip was when St. Paul and St. Aquilla worked with joy. Before Jesus ever came up in conversation, Jesus was brought up through acts of love. And the Lord said to Paul one night in a vision, “Do not be afraid, but speak and do not be silent; for I am with you …. (Acts 18:9-10). So, brothers and sisters, if you want to participate in the church’s mission first, be extraordinarily ordinary. You don’t have to be at a podium to start preaching the Gospel, but don’t use that as an excuse to not verbally preach. We read when St. Paul’s visits Corinth, that St. Paul argued in the synagogues every sabbath. It reads that when people opposed and reviled him he went to preach to the gentiles. 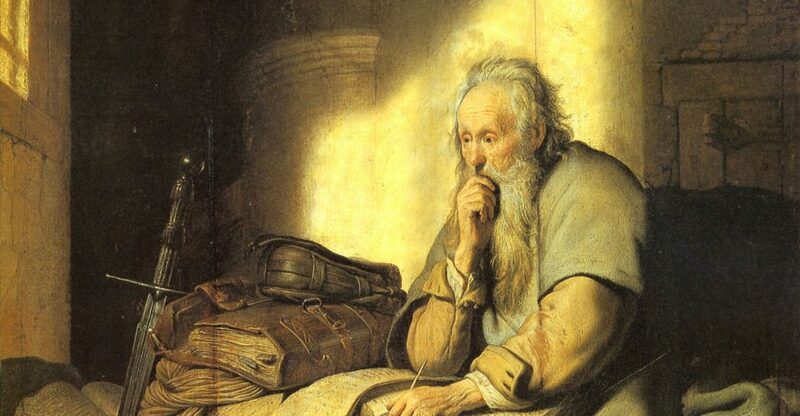 The Lord actually instructs St. Paul “Do not be afraid, but speak and do not be silent…,” St. Paul stays in Corinth, working as a tentmaker, and preaching for a year and a half. Now we can’t downplay this short reading of St. Paul in Corinth, we have 2 or 3 more letters written to this young church. The year and a half spent by St. Paul established the church that would later receive these letters. It is also important to note that Corinth was a highly traveled area specifically for commercial and pagan worship. This was a hotspot for intelligent conversation and debate, a place full of elegant preachers. Paul didn’t just earn his place as a hard worker but he earned his place by standing firm in the Gospel. He preached, and yes he got push back, but he didn’t leave until God’s word was planted and prepared to grow into a church. You and I are not likely to be an evangelist of the same caliber as St. Paul. So, how do we live out the great commission? I propose 3 things that we can learn from reading St. Paul: know Jesus (aka pray), serve at work and church, and invite people into the church. Know Jesus: We can’t get anywhere without prayer. How could we possibly introduce people to the Lord if we don’t know him ourselves? Spend time daily in scripture, meditation, and in conversation with Jesus. Even if it’s for short periods of times. When we know Jesus and love him it will be obvious and it will be almost impossible to not introduce him to people. Serve at work and church: It is impossible to not serve when we are in love with Jesus. This is simple and is a testament of something life changing within us. Do it with joy too, don’t just serve grudgingly. Be the first to offer help and be the best at doing it. I can’t stress enough how necessary it is so serve joyfully. Imitate our blessed mother who runs in haste to the hills to serve her cousin Elizabeth. At work you will build trust between you and your colleagues. You will build deep relationships built on something more than surface level conversations. When you serve at church people will know what you are about. You will build deep relationships with fellow brothers and sisters. When you have to turn down a night out on the town because you have church, your co-workers will know what separates you from the ordinary. Invite people into the church: This is probably the most intimidating bit of evangelization. We can ease our discomfort by remembering the first two suggestions. If we know Christ, we know the people we are evangelizing, and we know our church all we have to do is introduce them. It’s the same thing you did making friends growing up. You simply bring them together and be yourself. Don’t get discouraged if they turn you down. Don’t get discouraged if they don’t like your church community. Remember the first 2 suggestions. Keep praying for your co-worker, be best friends with Jesus, serve for the good of your co-worker, and serve Jesus at church. By doing this your ordinary life will have extraordinary effects for the Kingdom of God. So maybe we won’t cast out demons and heal the sick at work. We probably won’t build a church like St. Paul. Our lives probably won’t be nearly as centered around evangelization as was his. Our workplaces and churches look entirely different than 1st Century Greece, but we are still commissioned by Jesus to go into all of creation and preach the Gospel. Evangelization on the outside looks different but at its core it’s the same. It is through Jesus that ordinary life becomes extraordinary. Photo Credit: Rembrandt [Public domain], via Wikimedia Commons.